Besides the fact that certain elements presented by the two strange beings, one to my left and one to my right, while I was on the examination table later during the encounter, it was evident previously that the “mysterious intelligences,” who apparently were in the windowed saucer that was hovering above us, had a strong connection with at least a few of us in the past. This was when “the voice” spoke to us from the saucer, telling us about the young adult girl who had graduated from our local Wesleyan University. There were from thirty to fifty people present, including the girl. The voice told us that they (the mysterious intelligences in the craft) had worked with the girl in the past further east along Holdrege Street, which bordered the playground on the south. She waved, looked up at the saucer and smiled when they introduced her. The fact that they had worked with her in the past, that they knew where she lived, and that they were pleased that she graduated from college indicated they were very concerned about her cultural progress. It also indicates they periodically had been working with her for a least an extended period, I suspected at the time for a period of at least several years. She was levitated up to the craft first. They, the mysterious intelligences, also seemed to know the others somewhat personally, those few who subsequently were taken up into the saucer. But the voice didn’t vocalize as many details about them as they had the girl. It is puzzling that they paralyzed the entire crowd except for our small group, who were located a short distance away, before they took me up to the craft…and it seemed as if the crowd remained frozen until I was levitated back down. It is still shocking for me to know that they knew what I was thinking prior to my levitation to the craft…because as the voice approached my friend, sister, a couple of others and I, he verbally espoused that I was “hiding over here out of the way.” Knowing that I was totally petrified with the over powering feeling I was to be the next one taken, he consoled and psychologically conned me until I agreed to go up. During our first ascent and temporary decent to the ground, among other things, 1) they demonstrated a Masonic Ceremony and told me I should join the boys’ auxiliary organization of the Masonic Lodge; 2) they put me through the initial stages of an Ancient Egyptian ceremony; 3) they showed me small alligator or crocodile creatures who they said were in charge of my life-long education, development, conditioning and protection; 4) they visually showed me the propulsion system of the craft; and 5) they visually and audibly demonstrated that I would participate in a “project” in the future, a project that would include multistory buildings and other people. After we entered the craft, after I was placed on the examination table, a strange short doctor approached me on my right and began examining my legs. He appeared to be only part human. He told me I would have varicose veins in my legs when I grew older and that I would have a heart attack and heart surgery. And he told me, as a matter of fact, I would have more than one heart attack and surgery. But he also told me not to worry because I would survive and be somewhat restricted. What is astonishing and amazing is that this actually happened some 38 through 45 years hence and I have been somewhat restricted for over 20 years since that last coronary bypass surgery. After this occurred, as I lay on the examination table in the windowed saucer, several other things were said. The strange seemingly female being on my left asked the doctor to step into more brilliant light. She then asked me what I thought of his features. I was too frightened to respond, but she coaxed and urged me to answer, so I eventually told her that his hair was too red, thin and fuzzy and that I didn’t particularly like his small nose and cauliflower ears. She then asked if it would be alright if he lived a block or two away. Even though I now know she was trying to be somewhat funny, I then realized or rather strongly suspected that they, whoever they were, had created or genetically engineered the doctor and that they were planning to integrate a hybrid human into our society. 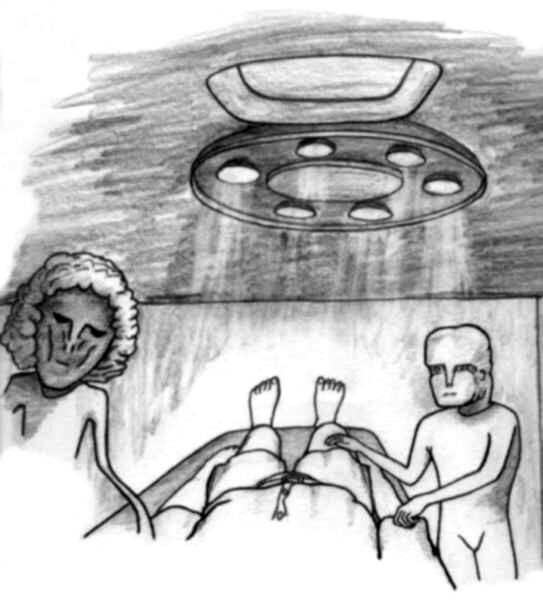 However, after integrating this idea with other facts and happenings related to this encounter and other encounters, I have come to the at least strong temporary conclusion that “they” always have genetically engineered humans from the birth of humanity. At the Bethany Grade School Playground encounter it seemed as if they were just stopping by to check up on a few of us and see how we were developing, somewhat testing us and conditioning us physically and culturally. It became completely obvious that they knew at least nearly everything I had done and they would know what I would do from that time forward because the voice essentially told me this as I descended from the saucer to the ground. It was as if they could see through solid structures and know my inner most thoughts and feelings. As a matter of fact, during the De Soto Bend Time Travel Experience (Chapter 13 in the book Eminent Discovery) they told me outright that they had participated in the creation of humans using something similar to test tubes, and that they had nurtured us throughout the ages. This obviously suggests a somewhat clandestine genetic engineering program. The fact that the short doctor directed a large shinny cylinder into my lower abdomen as I lay on the examination table suggests that they were changing my physical body in some way, possibly changing me by way of ad hock genetic engineering, correcting some deficiency in my body. The ideas that the mysterious intelligences were genetically engineering and nurturing humans throughout the centuries became somewhat obvious during this Bethany Grade School Encounter, as well as during other encounters that occurred throughout the years, when subtle and not so subtle implications were suggested or blatantly stated through what seemed to be the pre-planned actions and words of the mysterious intelligences. This and other astonishing ideas became particularly and strikingly obvious during The De Soto Bend Time Travel (Chapter 13 of the book Eminent Discovery) when “they” told me that I came from another place in the universe, when some of the “familiar strangers” and I were placed in a mysterious craft then taken to what was described as our “homeland.” I recall stars moving past the window of the craft when leaving and waking in the craft from what seemed to be a deep sleep after our return, but I don’t recall being there. …This suggests at least some kind of actual multiple life or past life existences/realities…i.e. unless time and space are indeed illusions and we live all lives in our past and future simultaneously but are only aware of the life of “now,” the life of what we call the present.